The Cape Elizabeth Lights, locally called Two Lights, have a long and eventful past. This includes many changes in appearance. The lights guided ships into Portland Harbor for just over a century, and today stand as relics of Maritime history. With their extensive past, and even today being at the heart of a local debate concerning the historical preservation of the keepers house, these lights have a story to tell. In 1811 the federal government recognize that the preeminence of the location called for the erection of some sort of a marker. They purchased a tract of land from Edward Dyer, and hired two contractors to build the tower. They were told to make the tower of the best undressed stone set in lime in the form of an octagonal pyramid. This was topped with a three-foot capstone and the top half painted black and bottom painted white. Although this was not a lighthouse it was sufficient for the predominately daytime shipping industry of the time in Maine. In the following 15 years the shipping past the end of the Cape increased dramatically. In 1827 the government approved for the construction of a lighthouse in the place of the monument. With the money given by the government they found it possible to build two towers, which would prove to be a much better maker. 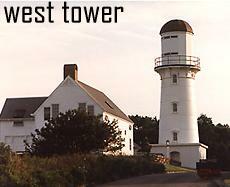 They purchased 12 more acres of land and began preparations for building the lighthouses. They made a contract with Jeremiah Berry for him two take down the 1811 marker and build two square, rubble stone towers at a cost of $4,250. When finished in 1828 they stood 300 ft. apart in an east-west direction. This alignment provided direction for ships coming into Portland Harbor and was later used for fishermen when laying and retrieving nets. At this point the west (or inner) light beamed an osculating light with a 90-second cycle consisting of 45 seconds of light and 45 seconds of darkness. The first light keeper, in 1828, was Elisha Jordan who received a meager $450 per year for the upkeep of the towers. In 1852 Congress appropriated $2,500 for installation of a fog bell, bell house, and striker machinery. Following this the newly formed US Lighthouse Board, in 1854, announced they were permanently shutting down the west light and converting the east light to a continuously osculating light. 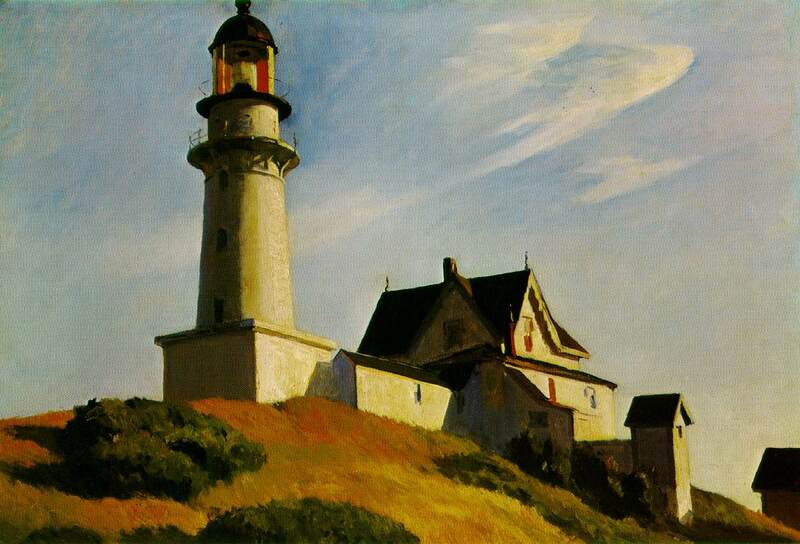 The reason given for the change was that the osculating west light looked too much like the Woods Island Light when the east light was not seen properly (in really bad weather). The west light was decommissioned for a year, during this year mariners complained about the decreased visibility and so the light was put back into use. Following this the Woods Island Light was changed into a red osculating light to avoid confusion. Shortly before the close of the Civil War the federal government felt it necessary for the lights to be more visible in the daytime. They decided to put a single vertical red stripe down the side of the west light and four broad, horizontal bands around the eastern light. Following these changes, in 1869, the US Lighthouse Board gave more money so to install a fog horn. This was a revolutionary steam-powered horn which would blow once every minute during foggy weather. But for a reason still undetermined this horn was replaced again with a second-class siren in 1871. By 1873 the towers had fallen into disrepair and the only chance was to have it rebuilt. At a cost of $30,000 both rubble towers were replaced with 60 foot iron-cast towers, their shells lined with brick. The iron was cast and bricks were made locally and included in the high cost of restoration. When completed in 1874 they were both painted brown to save on the cost of whitewashing. The east tower now beamed a 22,000 candlepower fixed light and the west became a 110,000 candlepower flashing beacon. Unfortunately the winter of 1876-76, just following all of the new repairs and changes made, the Maine coast suffered the harshest winter of the century. The sleet storms of January and February caused extensive damage that needed to be repaired in spring. The east tower required a whole new set of windows on the north side, and the west tower needed all new singles and a new coat of paint. Then in the summer of 1880 it was decided to paint them both white again for better daytime visibility. Two years later, in 1882, the US Lighthouse Board announced again that it was going to shut down the west tower. Again public outcry caused this decision to be reversed, but they did succeed in painting the towers brown again. There were periodic, but less frequent, changes made on the lighthouses of Cape Elizabeth. At the turn of the century the steam-powered whistles, removed not even 30 years before, were restored to use because of their superiority to the siren. In 1902 the towers were reverted to white, which they remain today. Then 13 years later the illumination was improved in the lighthouses by the installation of oil vapor lamps. Finally in 1924 the US Lighthouse Board announced they would shut down the west light, along with several of the multi-lighthouse stations in the country, and it's been closed since. Six days later the east light's pattern changed; it consisted of a 30 second period of six half second flashes with two and a half seconds of darkness in between, followed by 15 seconds of total darkness. In 1925, to compensate for the removal of the west tower, the strength of the east tower was increased to 500,000 candlelight power, making it the brightest beacon on the Maine coast, and even today the second brightest on the eastern seaboard. 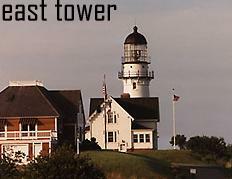 In 1966 the Cape Elizabeth Light, after 150 years of being man-worked, became automated. Four years later the east light was recognize by the US Postal Service when a commemorative stamp was issued on Maine's anniversary celebration. This stamp used the famous painting by Edward Hopper, made in 1927, that is today in the middle of a serious preservation debate. The lighthouses at Two Lights remain a tourist attraction for thousands each year, and for residents a relic of the past in their own back yard. The eastern light has been called, by Ken Kochel in his book American Atlantic Coast Lighthouses, one of the most beautiful lighthouses in the state and the western light's intricate patterns keep the inactive lighthouse beautiful. Even today, when lighthouses are rarely needed for navigational purposes, with the advent of computers, satellites, etc., they are pieces of our past that deserve to be preserved for future generations to come and enjoy.